You are always tired. Are you waking up as tired as you were when you went to bed? Your mattress may be keeping you from getting the necessary hours of sleep you need. If you are noticing any of these signifiers in your daily life, then it’s time to change your mattress. Is a firm mattress always better for me? Answer: The Short answer is no sometimes a firm mattress can cause pressure points on particular parts of the body and as a result this can increase movement during sleep and as a result a more disruptive sleep. Answer: On average, your mattress should last anywhere between 8 to 10 years. However, there are a lot of elements that can increase or decrease the longevity of your mattress. Your mattress is an investment – the better you take care of it and the more money you put into it will increase the longevity of your mattress. Answer: To maintain your mattress takes very little to no time. In return, you can increase the return on your investment by increasing the mattress’s longevity. The only real cleaning of your mattress you can undertake is hoovering after that a mild damp cloth to dab put not really advisable to wet the mattress or use chemicals on it, they may damage the fillings and fabric. It is very important to use a mattress protector to help prevent soiling, any soiling will null and void your manufacturing warranty. What is the difference between an open coil spring system and a pocket spring system? Answer: An open coil spring system or Bones is the most traditional form of spring unit and consists of a continuous coil being turned to form the spring units which are connected. The Pocket springs are individual springs which behave independently of each other depending on the amount of pressure they are under. The open coil spring can offer very good support however the pocket spring system offers more support and for couples less roll together. Answer: One of the most important things you can do to maintain the longevity of your mattress is to rotate it. The reasoning behind it is simple: body conformity. Breaking in a mattress is similar to breaking in a pair of shoes. Your new mattress will conform to the contours of your body the more you sleep on it. Within the first few nights, you’ll start to notice the conformity taking place. You’ll start to notice some impressions as your mattress gets more comfortable. Body conformity is a double-edged sword. As your mattress conforms and gets more comfortable with your body, it also develops deeper body impressions. As a result, these impressions can lead to sagging if you don’t rotate your mattress. At Ger Gavin's, we recommend that you rotate your mattress every two weeks within the first three months. 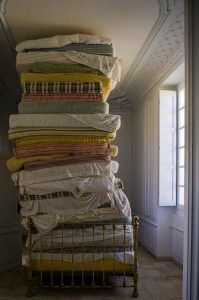 After three months, rotate your mattress once every two months.